"Simpson’s Rules are among the most useful tools that designers have in their 'math toolbox.' They are the simplest to apply, the least accurate of similar methods and the easiest to screw up - when I say similar, I exclude the trapezoidal rule and counting squares." 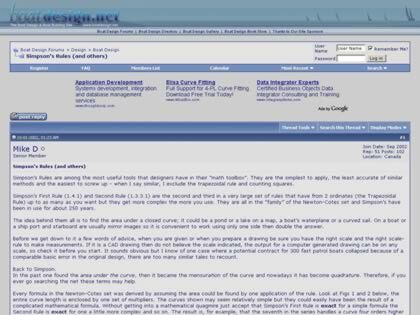 Web Site Snapshot: If available, above is a snapshot of the Simpson's Rules (and others) web site at http://forums.boatdesign.net/showthread.php?threadid=951 as it appeared when this site was added to the directory or last verified. Please Note that Boat Design Net has no involvement with the above web site; all content and images depicted in the above thumbnail are the property and copyright of Simpson's Rules (and others) unless otherwise noted on that site. Description: "Simpson’s Rules are among the most useful tools that designers have in their 'math toolbox.' They are the simplest to apply, the least accurate of similar methods and the easiest to screw up - when I say similar, I exclude the trapezoidal rule and counting squares."